The blogger app for the ipad doesn't let me edit photos and text the way I like, so I have to upload photos but then switch to my laptop, which explains why there are random posts with no explanation. I don't find much time to sit and write these days. Last year, my friend, Azusa, helped me knit Woody's Halloween Yoda hat. She taught me some basic things and I've been learning ever since. 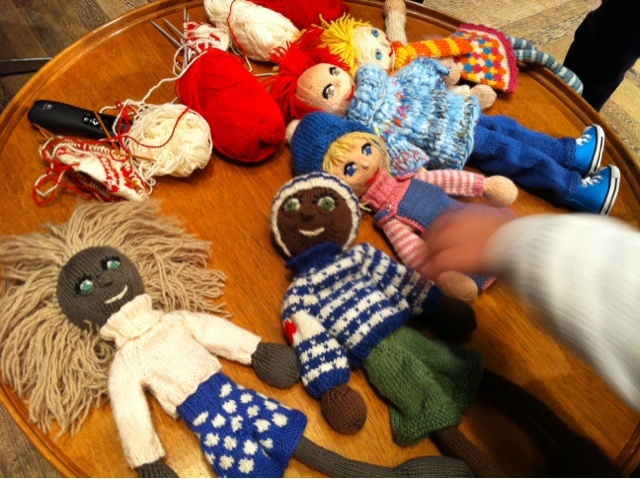 Knitting is quintessential Scandinavia. Little girls learn at a young age and seemingly everyone I know has had some experience with this craft. I guess the long hours of dark and cold in this northern region and the need for warm woolen garments pair nicely with knitting. 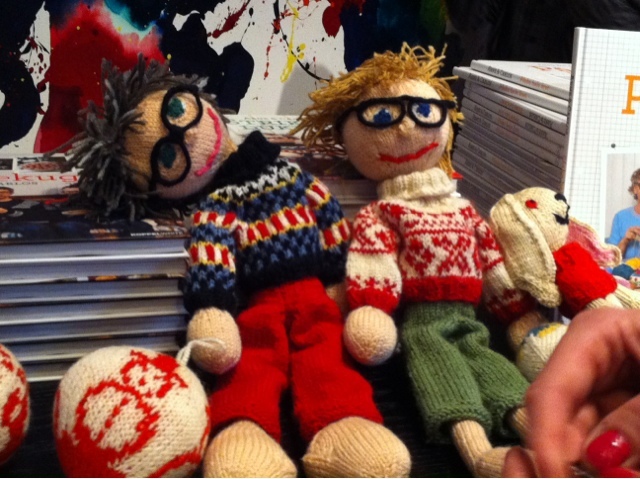 A few weeks ago, some friends and I attended a knitting workshop at the Louisiania Museum hosted by Arne & Carlos. These two are something of cult fame in Scandinavia. They are a Swedish and Norwegian couple who are former knitwear fashion designers (sounds a bit like an oxymoron, no?) 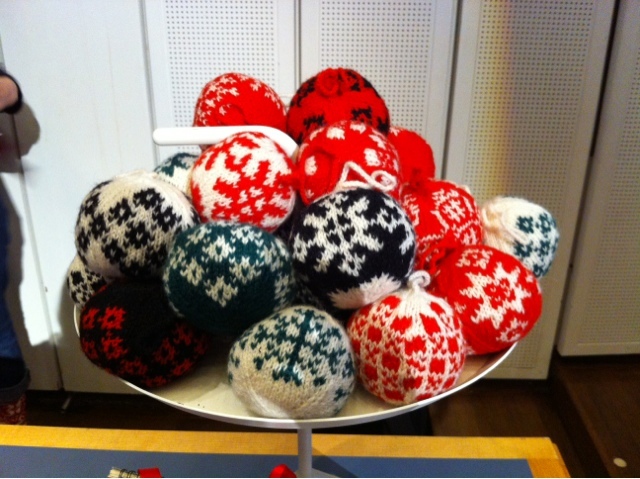 and have made their name in the knitting world with the creation of their Christmas balls (julekugler). The julekugler became famous after Arne & Carlos were commissioned by Comme des Garcons to create their winter window decorations in Tokyo. They are kind and funny, which you can see in this video, and I suppose it is what has endeared them to people the world over. They live on a farm in Norway and travel around telling the story of their company and just knitting with people who come to meet them. They have also written a book based on their doll creations. Can you see their likeness in yarn? These are so cute. I'd like to make one in the likeness of each of the boys. I picture striped t-shirts, wild blonde hair, pants with holes in the knees and a jam-stained face for Woody's doll. 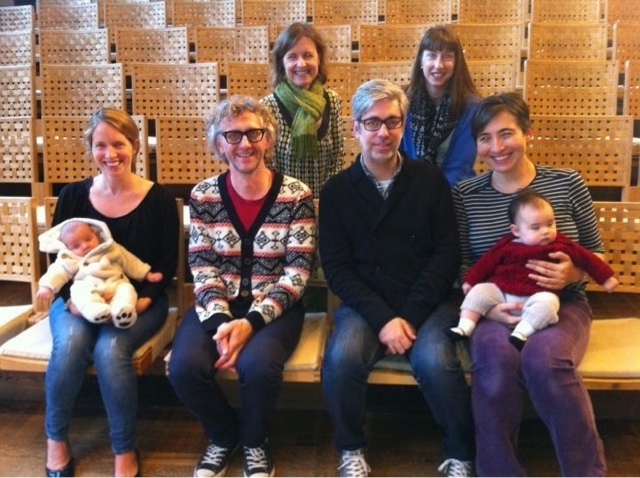 They are currently on their way to do a book tour in the US and will be visiting Portland in February. Even if you don't knit, they are really fun people to meet. And you'll be able to understand their workshop in English better than I did in Danish. Are you in a knitting club?